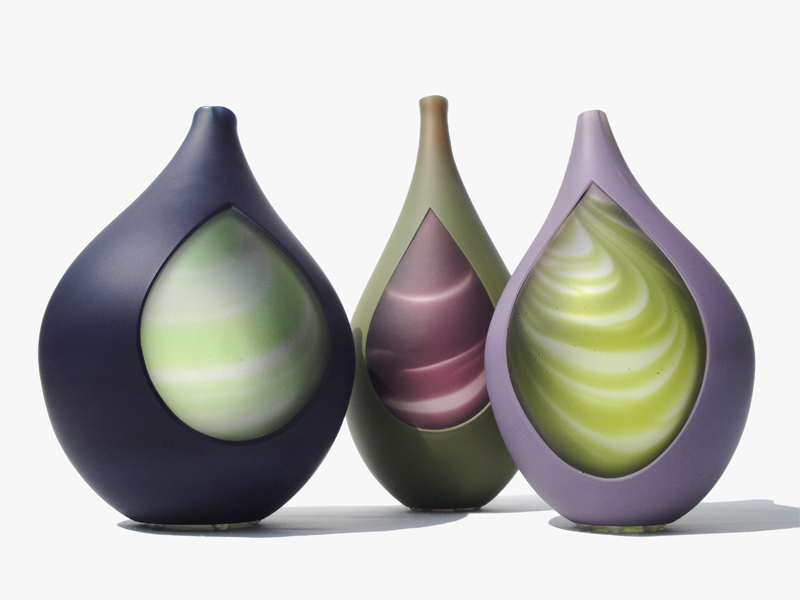 DN member Catriona MacKenzie- is a designer/maker of contemporary high quality glassware and jewellery. Catriona recently took part in our Design-Nation exhibition Colour & Form and we managed to ask her a few questions about her inspiration, practice and more. Design-Nation asked: Can you tell us about your practice and how your business began? 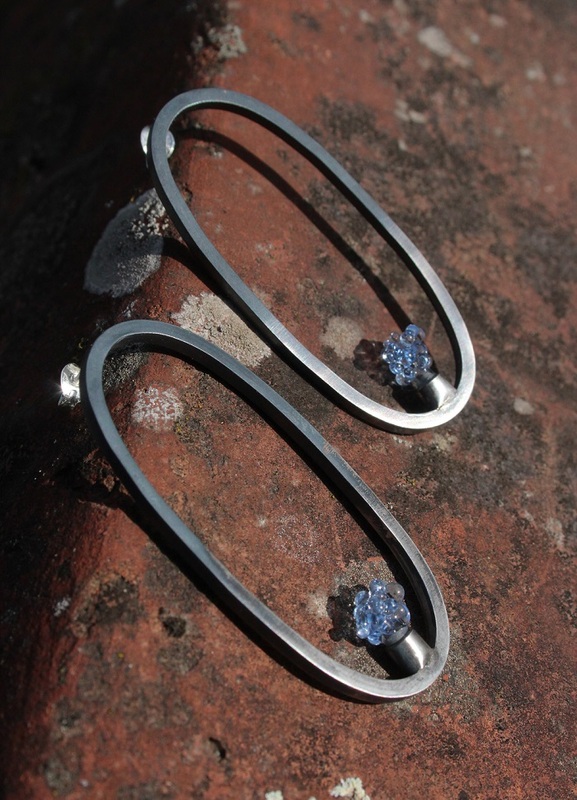 Catriona answered: I went to Edinburgh College of Art with the initial idea of studying Jewellery and Silversmithing and happened upon the Glass Degree there. I had the aptitude for hot glass from day 1, and the rest is history really. 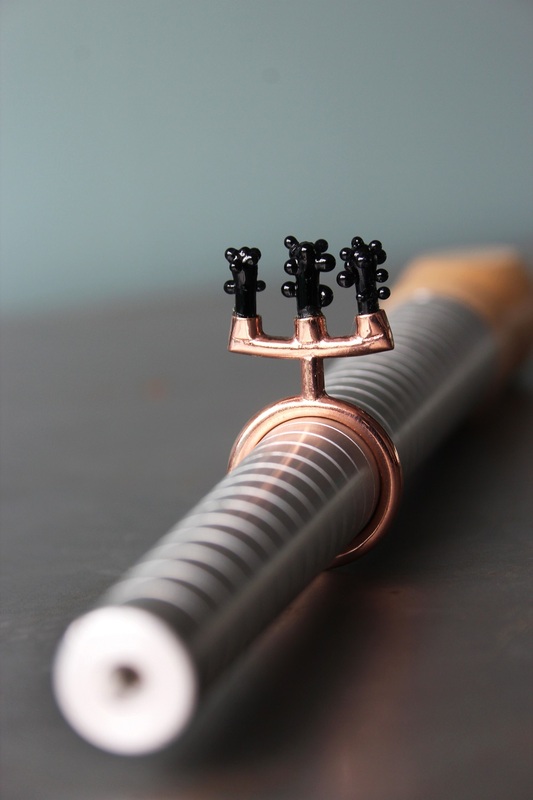 I continued doing jewellery as a second subject and specialised as a glassblower in my BA (hons) Design & Applied Arts Degree. In my 3rd year I was chosen on merit to go to Alfred University in NY State, where I specialised in Hot Glass and Molten Glass Casting. My time in America really helped to cement my love for working with glass in its fluid state and for carving it, once it was cold. On my graduation, I attended the prestigious International Glass Centre near Stourbridge, to do a two year postgraduate diploma. 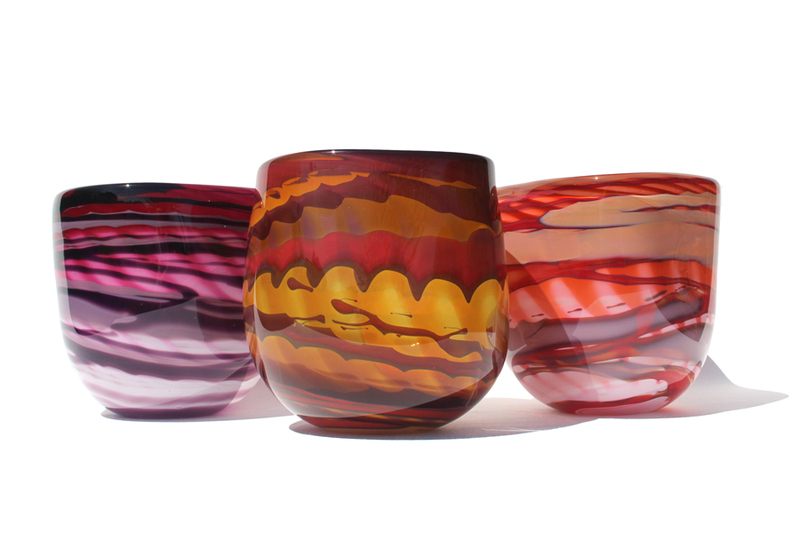 The IGC pushed me technically, and I learned the skills I needed create blown and cut pieces of contemporary glass. I left after gaining distinctions in all areas. Since leaving education I’ve worked as a glassblower in a busy studio and worked my way up to Manager, while also designing and making my own work. In 2011, I left to move to Bristol and worked in various other glass institutions as a tutor and sales assistant while also working on my own professional development, both in glass and in jewellery. I then started up my own company, and underwent business mentoring with the Crafts Council in their Hothouse scheme. In 2015, I moved into my first studio. In 2016 I moved into Centrespace Studios in the centre of Bristol, UK. 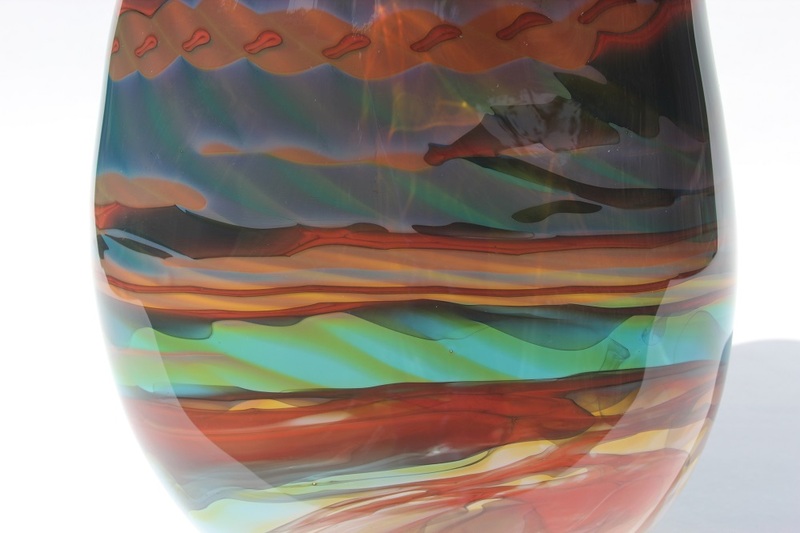 C.MacK: I’ve had two influential tutors: While studying in America, my molten glass tutor was Stephen Dee Edwards who was very enthusiastic and supportive of me and my work. He pushed me to express myself using glass and other mixed media. This is something I still like to do. D-N: What inspires you and your work? C.MacK:: Many things inspire me, but the major inspirations are mycology; my native Scotland; and trying to express the sanctuary I find in nature. Colour is very important to my work, it can be the colours from the forests of home, or the graffiti of Bristol. Textures also play an important part – I want the viewer to be enticed into touching the work I create, and to hopefully feel comfort from it. D-N: Can you tell us a bit about your design process? C.MacK: In 2018 I went to Northlands and worked with Tobias Møhl. He’s one of my favourite glassblowers. He worked with me on some of my designs; I’d really like to do that again, if the opportunity were ever to arise. There are many makers I admire and would like to collaborate with. It’s something I am very open to. I would like to collaborate with someone in a different material such as wood, ceramics or metal. If anyone is open to that then please do get in touch. D-N: If you weren’t a designer what would you be? C.MacK: I’m not sure I could be anything else…haha..Biology was my second favourite subject at school, so maybe the mycology would have become more than a hobby, but I think I am doing what I have to do, it’s in my blood. D-N: Why did you join Design-Nation? What do you enjoy and find helpful from being a member? 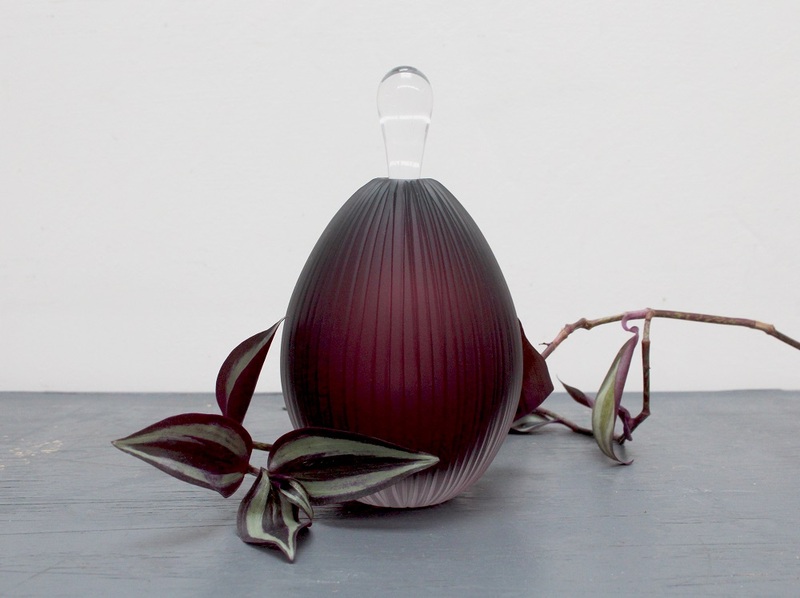 C.MacK: I joined Design Factory (now Design-Nation), to be represented within the contemporary Craft world. 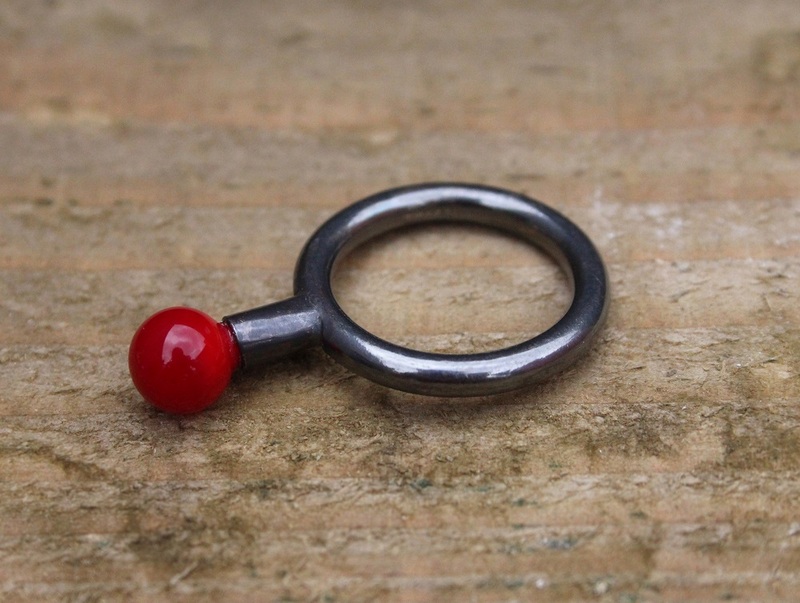 I also wanted to be connected to other makers within my area and further afield. I’m still to properly take advantage of all that Design-Nation has to offer, but it is good to know that they are there and have my back. Being self-employed and working alone can sometimes be an isolating place, so networking with others is a good thing to do, and Design- Nation offers that support. D-N: Have you got any exhibitions, commissions or events coming up that you are taking part in? C.MacK: I’ve just been part of the Design Nation “Colour & Form” exhibition, which was a great. Coming up, from the 30th March, I have “A Colourful Life” at The Byre Gallery in Cornwall.